So today marked the beginning of the project mentioned in my last thread, a 1980 Hammond V-1940 San Tropez. The engine, outdrive, and bellows have been serviced recently by the marina I work at and the hull and deck are solid and need no repairs. Today she has been stripped down to bare decks to assess what I need and what I am going to change the layout to. The gelcoat is coming back with dry and wet sanding which is a big plus, the look of the boat depends on it. So far I've decided to re-purpose the old helm seat on the Port side while taking the lounge seating up to behind it, rounding all three corner points of the bench. The rear section will have the original wet bar and cooler mounted in the center as well. A new fully adjustable pedestal helm seat will be installed. The old "woodgrain" glovebox and Stbd Gunwhale will be vinyl-wrapped a matte carbon fiber or other texture while wrapping the glove box lid and dash around the gauges in Burl wood as an accent. I'll attempt to build two filler cushions for the bow area along with making the carpet a snap-in only. New gauges, switch panel, fuse block and ground block, blue LED interior lighting, LED Nav lights, Blue underwater lights to be added. I will be adding two speakers up forward and two aft, with a subwoofer and amplifier for all. It's gonna be a long project but ready for splash-in next Spring. "vinyl wrapped box and dash"? Have you thought about 'hydrographics'? Pretty cool. Easy to do at home, and thousands of designs from carbon fiber to wood to stone. Love the ole Hammonds Joey, you're going to have one fine luxury cruiser when you're done sir! Looks comfy. Should be a nice ride. We'll be watching. Haven't heard of them, will look into it though. I want towrap it in something as I don't want to paint and have an uneven finish. Excellent project Joey, she'll be great when your done! I'm going to end up wanting clear gel coat over the top of everything when I'm done, does anyone have any recommendations for what product to use? Nothing else is bringing the wet luster back after sanding like a new layer of gel would. I would give the gang at www.uscomposites.com a call and ask their advice. Very knowledgeable and helpful folks IMO. Sorry for the silence here, I'm off at work but the project has not stopped. I'm planning on spraying clear gel next spring and assembling the boat afterwards. I've assembled my list of supplies and goodies to be ordered which is quite extensive but worth every penny. I also decided to modify the seating arrangement from the XL, to something more user friendly, a pedestal seat P+S forward, shortening the Port bench to just behind the pedestal seat. The corner cooler will be moved to the starboard side; I will add to the cooler going forward with enough length to build an open cubby box facing inboard on the deck to slide a portable cooler in. Above this space I intend to add enough height (1) to be able to add a small cabinet for storage and (2) have its height be below the gunwale. In place of the port cooler, I will cut the corner to make a better seating surface. Primary searing color will be a leather-look vinyl in medium gray, with blue piping accents. Secondary vinyl will be blue but used in low-key areas. I will pleat the seats, but not as heavily as the factory had. Grey Berber glue in carpet sans engine areas and ski locker. The bow will have a snap-in portion of carpet. I still am vinyl wrapping the old wood patterned areas-I have to repair some spots so the alternative water dipping won't work. The glove box and dash panels I will wrap in a burl wood look, as the starboard panel I will go with carbon vinyl, I will also cover the stern area that had a wood vinyl in carbon vinyl-also this is where I will add the name. The engine area, bilge, and ski locker will be painted white. Blue LED courtesy lights in key areas. VDO gauges in black and chrome. New switch panel with labeled Contura switches and breakers. Debating docking lights, I don't think the hull shape can accommodate. Kicking myself for the cost but can't sway myself from a full Rockford Fosgate stereo. All blue LED cup holders. 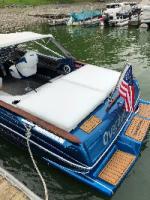 2 cup holders on top of the cut corner space seat back, 2 on the original cooler top, 1 either side by each pedestal-in ridge above deck, 1 in port bench forward arm rest. Unsure about bow area, I likely will install a pedestal table. New 12V sockets- 1 in glove box, 1 at helm, and one in cooler area. Also adding dual USB socket in cooler area. You've a lot more ambition than I have. Sounds like a home. Be afraid of hidden reefs, rocks, hidden logs on your maiden voyage. We'll be watching. My father has been working on her the past few weeks, he found rot beneath where the trim pump and battery stood....figures. The plus side is that it is just that corner. Spoke to him today and it's just about ready to be wrapped back up after some new wood and fiberglass was installed. From there, it's time to start on the seat frames to get a better idea of the vinyl and foam needed. Already picked up a few parts (albeit stereo parts) that were on an end-of-year sale. I've decided that if funding permits, a Corsa Captain's Call through hull exhaust is in order...gotta love a V-8 with open pipes. MPI anyone? Likely picking up a cheap sewing machine to make better seat covers; It'll open up far more options for assembling everything. I keep making changes as I go, it's a disease. Looking into Starboard for the new ski locker lid, fuel sender access cover, engine bay dividers, and possibly seat bottoms. Might not install a table forward and have one aft instead...unsure yet as I have to assemble the rest of the boat to get a better idea of what I need. Don't worry all, the good stuff shall be coming soon, and with pics! Sounds like a good plan and yep can't beat the sound of V-8 exhaust coming out of a through hull!!!!! You most assuredly have the disease. The slippery slope, the never ending money pit. B-O-A-T ... Bust Out Another Thousand. Rest easy my friend, you have lots of company here. We are watching you for selfish reasons...to get more ideas. Keep the thread going. Got home Wednesday, so I started to work at her a bit. Here are a couple of pics of the rot location and repair, it's raining so I could not snap a shot of the finished product. I'll be updating as I go, more to come. Can anyone tell me why pictures will not load in any post of mine except the original? I have updates, but it's ridiculous to not be able to post pictures. When you want to post a picture make sure the size is right. Usually 1000 pixels or less is good. To resize your pictures use the 'paint' program or something similar. Once they are resized just post them like you did your originals. If the pics are too large they will not load. I see your photobucket pics are well over 2000 pixels each. Tried resizing, not the problem apparently. This will be the last update for a while sadly, I'm taking a job that will keep me away for many months. I removed every snap and fitting on the hull except for the rub rail in prep for the new gel next year. Great progress. Good luck on the job. With your plans for the boat it sounds like it won't be an overnighter so slow and steady. Just to make an update; I've been amassing parts and goodies for whenever I get the chance to put her together-later than I wanted but that's life. The biggest issue is finding a way to get her re-gelled, I have the gel and glitter flake but can't seem to get it done...this is my biggest road block to completion as the assembly relies on it. Contemplating doing it myself if I get home for a weekend, any thoughts/tips? Just a quick update, the project is still ongoing-a new job has taken all my time so not much is left for the boat. Also, I have yet to find a good place to re-host my pictures so standby for those. New Mercruiser updated manifolds instead of the "logs". So she's ready mechanically, and re-winterized. Now the patching of old screw holes begins, along with some dry-rot I never noticed. I just posted from my phone, I'll get on resizing tomorrow hopefully. Pics looked good to me. You've been busy for someone who is keeping up with life. Thanks for the update. I was unable to replicate the wood grain on the dash pieces properly, so I decided a few coats of dark gray with clearcoat was my best option; I filled, reinforced, and sanded all the pieces to get the best longevity as possible. Re-worked all the gauges and pre-wired the dash; Made a new glove box lid of King Starboard, wired the outlets and light in prep for install. Iâve repurposed almost all of the original teak for trimming the edges, and it looks great to have it accent the boat. Iâll have more pictures up of the original badges that I had to strip and delicately paint to be acceptable, not perfect for re-use. This has been one hell of a project thus far. Lookin' pretty spiffy. Time to spend some well deserved rest by just floating around. Like most restorations the time at the launch site talking to all the onlookers is longer than time on the water. Great job! Now for the trailer...... I hate doing trailers. 63 Sabre wrote: Lookin' pretty spiffy. Time to spend some well deserved rest by just floating around. Like most restorations the time at the launch site talking to all the onlookers is longer than time on the water. Great job! Now for the trailer...... I hate doing trailers. It hasn't been that bad, lots of comments here and there but next year I'll have more time out. As for the trailer, I've already taken care of the wiring and mounted all new LED's. New bow keel roller and safety chain yesterday; she really needs to be blasted and painted more than anything as the wheels/bearings/springs/etc are all well sorted. I have been using the boat throughout the days as I've been finishing the details, I can't keep her dry if I can help it.